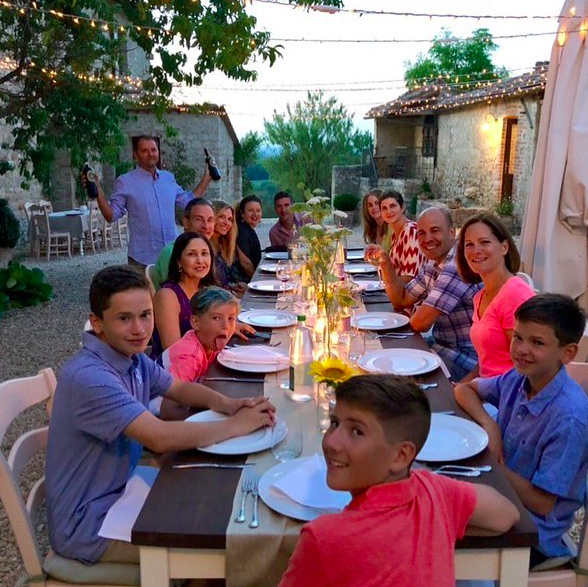 Join health, wellness and weight loss expert, Liz Josefsberg, in the Tuscan countryside July 27th - August 3rd for an unforgettable, life-changing adventure! During this magical, intimate and all inclusive week, you will receive personal support from Liz, working one on one with her to create the best plan for your health and lifestyle. You will leave with a blueprint for how to live your healthiest life through simple, manageable and easy to implement ideas. Liz leads you on a personal journey of a lifetime - educating, empowering and inspiring you to live your healthiest life through simple ideas, all while showing you that this can be done while having the time of your life. With over 15 years in the health, wellness and weight loss industry, Liz has one simple mission: to educate, empower, and inspire others to live and sustain healthier lives. Liz is likely best known for her hands on involvement helping Oscar winning actress and singer, Jennifer Hudson, lose weight and transform her life. Liz’s roster of celebrity clients also includes Jessica Simpson, Charles Barkley, Katie Couric and Amber Riley, among others. She is also the author of the best-selling new book ‘Target 100’, the revolutionary “Success Handbook” (2013, Weight Watchers) and “Find Your Fingerprint”. Liz consults in the wearable technology sector, creating weight loss programs for forward-thinking companies like Lifetime Fitness. Liz has served as an ambassador and national spokeswoman on television shows including Good Morning America, QVC, The Dr. Oz Show, The Oprah Winfrey Show, Katie! and The Doctors. Liz has written for national print publications such as People Magazine, The New York Times, Ebony, Real Simple, Women’s World, and Us Weekly Magazine. The setting for the retreat will be the 1,000 year old exclusive estate, Villa Montecastello, a working organic farm and olive orchard that has been immaculately renovated to offer its visitors an authentic luxury experience in Tuscany. Located one hour south of Florence, the Villa is surrounded by olive groves, with vineyards and nature reserves at its base. Villa Montecastello is a full size working organic farm, producing award winning extra virgin olive oil, as well as a unique and vast assortment of garden produce and herbs which will be used in your meals and cooking classes throughout the week. The villa is home to an array of farm animals including the local breed of Cinta Senesi pig, donkeys, chicken and guinea fowl. Every detail of your week will be taken care of with the utmost attention to detail, so all you have to do is arrive and be ready to have the time of your life! Villa Montecastello will be your private Tuscan oasis during this week-long retreat. The week includes all overnight accommodations at Villa Monte- castello, 7 breakfasts, 7 lunches, 6 dinners, welcome Prosecco reception, 1 massage, 2 one-on-one personalized sessions with Liz, daily workouts, daily meditation, all local transportation as described in the itinerary, airport pickup and drop off at Florence airport. Daily breakfast buffet includes locally baked goods and produce, coffee, tea and juice. Special breakfast items available upon request. House wine served with dinner from our professionally curated selection. Not Included in Pricing: Airfare, extra beverages outside of meals, transportation or activities outside of itinerary. Each room is uniquely furnished with the utmost attention to detail. All rooms offer luxury hand ironed linens, handmade olive oil soap and shampoo, fresh cut flowers and air conditioning. Villa Montecastello offers 8 room options of varying sizes and pricing, each is filled with beautiful antiques, warmth and charm. The Villa Montecastello has many shared sitting areas both inside and out, a library filled with books about Italy, food and wine, as well as a professional chef’s kitchen where your cooking class will take place. Frantoio Suite // $6950 per person for double occupancy: Our most romantic room, beautifully appointed with a King size canopy bed and en suite bathroom with claw foot tub. Pendolino Studio // $6650 per person for double occupancy, $7150 per person for single occupancy: A charming studio with Queen bed, private en suite bathroom and kitchenette. Foresteria Bedroom // $6650 per person for double occupancy, $7150 per person for single occupancy: A beautiful large bedroom with King bed or two Twin beds and private en suite bathroom. Moraiolo Bedrooms #1 & #2 // $6350 per person for double occupancy, $6850 per person for single occupancy: Cozy and lovely rooms with private bathrooms across the hallway, just a few steps outside the room. Bedroom #1 has the option for a King bed or two Twin beds. Bedroom #2 has a Queen bed. Frantoio Bedrooms #1 & #2 // $6050 per person for double occupancy, $6550 per person for single occupancy: Well appointed and roomy bedrooms share an extra-large bathroom with separate room for shower and toilet for additional privacy. Bedroom #1 has a Queen Bed and Bedroom #2 offers the option of King or two Twin beds. 50% deposit is required to secure your booking, 50% balance is due (4) weeks before arrival to Italy. Deposit payment can be made by Credit Card (Visa, Mastercard, American Express or Discover) or Personal Check made payable to Montecastelli Selections. We hope you can join us in Tuscany!